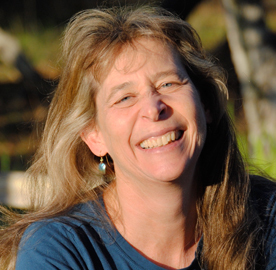 Holly J. Hughes is a writing teacher, poet and essayist with a long-time interest in writing, nature and contemplative practice. She has taught writing workshops at Fishtrap, the Rainier Writers Workshop, and Edmonds Write on the Sound, as well as teaching at Edmonds Community College, where she co-directed the Convergence Writer’s Series. Her fine-art chapbook Passings received an American Book Award in 2017. A former commercial salmon fisherman and mariner, she has spent 30 summers working in Alaska, most recently as a naturalist, and currently divides her time between Indianola and Chimacum, Washington.